An aerial inspection took place after the 16 August, M 7.8 earthquake 200 km to the NW. Weak-to-moderate, white vapor emissions were observed from the main fumarole field in a valley on the N flank of the summit lava dome. Sublimate deposits in the valley appeared to be less extensive than when last inspected in 1989. The lake at Loloru's summit appeared normal. There was no discoloration of lake water and the level of water appeared to be unchanged. Information Contacts: Patrice de Saint-Ours and Ben Talai, RVO. The Global Volcanism Program has no Weekly Reports available for Loloru. "Aerial inspection showed that dome and flank solfataras were active as normal. Water temperature most recently recorded in a pool by the stream draining the caldera lake was 80°C." Information Contacts: K. McCue, Bougainville Copper Ltd.
"The main thermal area on the middle NE flank of the dome was visited on 25 April. A temperature of 108°C was measured at the main fumarole, which was surrounded by a mound of sulphur ~1 m high. Measurements since 1964 had obtained maximum temperatures of 93-97°C. Emissions from this fumarole formed a column up to 20 m high, and were accompanied by a low roaring sound. Both H2S and SO2 were detected, and occasional droplets of molten sulphur were ejected." Information Contacts: D. Lolok, C. McKee, and B. Talai, RVO. Loloru, the SE-most volcano on Bougainville Island, is the source of a broad ignimbrite apron that covers much of the southern part of the island. The summit consists of two nested calderas, and a forested andesitic lava dome that restricts a crescent-shaped lake to the eastern side of the younger caldera. The smooth flanks of the pyroclastic shield are dissected by radiating deep valleys. A pristine lava flow occurs on the SE flank. Loloru is constructed within the 10 x 15 km Pleistocene Laluai caldera. The topographically higher Taroka group of volcanoes to the NW and the Takuan group to the north also were constructed within the caldera and served to deflect the bulk of Loloru ignimbrites to the south. The most recent of several major Holocene explosive eruptions at Loloru took place about 3000 years ago. Blake D H, Miezitis Y, 1967. Geology of Bougainville and Buka Islands, New Guinea. Aust Bur Min Resour Geol Geophys Bull, 93: 1-56. McKee C O, Johnson R W, Patia H, 1989. Assessment of volcanic hazards on Bougainville Island, Papua New Guinea (abs). New Mexico Bur Mines Min Resour Bull, 131: 182. There is no Deformation History data available for Loloru. There is no Emissions History data available for Loloru. 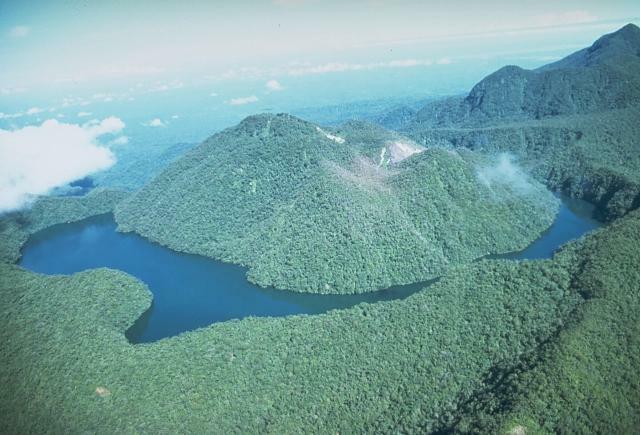 The summit of Loloru volcano on SE Bougainville Island is truncated by two nested calderas. A forested lava dome restricts a crescent-shaped lake to the eastern side of the younger caldera. Loloru is constructed within the 10 x 15 km Pleistocene Laluai caldera; part of the rim of this outer caldera is seen at the lower right. Pyroclastic flows from the volcano cover much of the southern part of the island. The most recent of several major Holocene explosive eruptions at Loloru took place about 3000 years ago. Photo by Wally Johnson, 1988 (Australia Bureau of Mineral Resources). There are no samples for Loloru in the Smithsonian's NMNH Department of Mineral Sciences Rock and Ore collection. Large Eruptions of Loloru Information about large Quaternary eruptions (VEI >= 4) is cataloged in the Large Magnitude Explosive Volcanic Eruptions (LaMEVE) database of the Volcano Global Risk Identification and Analysis Project (VOGRIPA).